If you’re looking for convenient and reasonable Atlantic County dumpster rental, call on the Starr team. Starr rents multiple large sizes of dumpster rentals for homes and businesses from our central location in Franklinville, and our footprint extends throughout most of South Jersey. 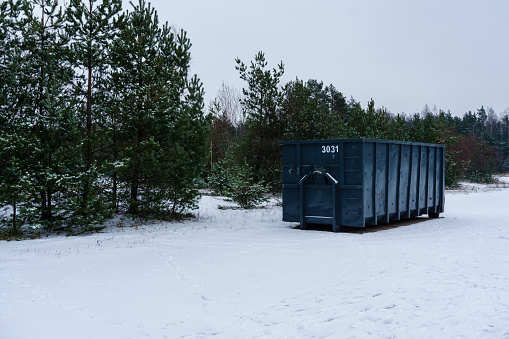 Our dumpster rentals are available for mixed material construction and for rates as competitive and affordable as any in the region. Starr is fully licensed and insured in New Jersey. Starr Dumpster Rental is a division of the Starr General Contracting companies in South Jersey. Starr General Contracting is still family owned and operated, and has been serving home and business owners for over 30 years now. In addition to dumpster rentals, Starr General services include painting and roofing, septic inspections and repairs, and portable toilet rentals. We’re proud of our track record of continued success, and our customers know the big blue star on our trucks means quality and reliability. At Starr, our Atlantic County dumpster rental services include 11-yard, 12-yard and 14-yard size dumpsters. Our pricing system works by weight, rather than dumpster size, so our rate is the same for every size dumpster we provide. For two tons of waste our weekly rate is just $350, plus sales tax. Beyond two tons of waste, we charge $80 for each extra ton. If you plan to rent for a shorter time, call us…we offer discounted rates for rentals of 48 hours or less. So when you’re looking for large dumpster rentals at a great price, call us today at (856) 875-5020 to find out our availability, or e-mail us using this form. We’ll move your waste away quickly and for a very fair price. Please be advised that we cannot allow restricted or hazardous waste in our dumpsters at this time, such as asbestos, chemicals or other dangerous waste products. You will need specialized service for such waste.